Efficient lentivector delivery of gRNA for our Two Vector Cas9 SmartNuclease System—EF1α-GFP-H1-gRNA. Efficiently deliver gRNA using our Cas9 SmartNuclease™ Lentivector System. 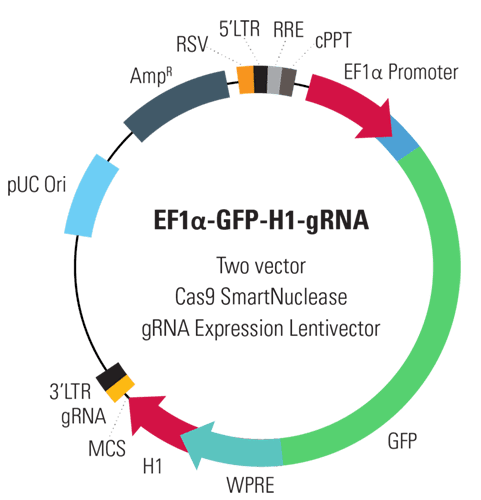 Great for when you want to create stable Cas9 editing cell lines and/or would like to edit the genome of a cell line that is resistant to transfection by plasmids, the EF1α-GFP-H1-gRNA Two Vector Cas9 SmartNuclease gRNA Expression Lentivector works with any of our Cas9 SmartNuclease Lentivectors. MSCV-driven Cas9 and CMV-driven Two Vector Cas9 SmartNuclease Lentivectors efficiently deliver Cas9 to transduced cells for efficient genome editing. Figure 1. Two Vector Cas9 Lentiviruses efficiently knockout stable RFP reporter gene. METHODS: Phase and fluorescent images of modified HEK293T cells stably expressing RFP and GFP (top panels), which have been co-infected (MOI = 3) with the MSCV-Cas9-T2A-Puro Two Vector Cas9 SmartNuclease Lentivector (Cat.# CASLV125VA-1) and a gRNA virus expressing a guide RNA targeting RFP (EF1α-Blasticidin-H1-RFP gRNA, Cat.# CASLV500PA-B; bottom panels). Images of cells were taken 11 days after placing the cells under selection, and show ablation of RFP expression in target cells infected with both the Cas9-expressing Lentivector and gRNA-expressing Lentivector (bottom panels). Figure 2. Transduce Cancer Cell Lines with Cas9-Lentivirus. METHODS: (Top panels) Phase microscopy image of MCF-7 breast cancer cells infected with pseudoviral particles of CMV-hspCas9-T2A-Puro (Cat #CASLV100VA-1) and selected with Puromycin (1 µg/ml) for 10 days in culture, show distinct colony formation. (Bottom panels) Immunofluorescence staining of Cas9 protein expression in MCF-7 cell lines stably transduced with the CMV-hspCas9-T2A-Puro Two Vector Cas9 SmartNuclease Lentivector (Cat #CASLV100VA-1), show punctuate nuclear and perinuclear staining indicative of strong Cas9 protein expression in the nucleus.